Here in Asheville we have some amazing restaurants - crazy amazing. But there is one that stands out in Southern Living and is an almost required stop for all tourists… Tupelo Honey Cafe. They call themselves a New South Kitchen with classics like fried green tomatoes, grits and fried chicken. And who can call themselves a southern kitchen if they don't have mac and cheese on the menu? I received their cookbook - and love all the recipes, but I wanted to add a little spin to their mac and cheese with a few changes… first stop? Let's add bacon. You know, because bacon always makes things taste better. 1. Spray 9x13 baking dish with non stick spray. In a food processor, pulse the crackers, panko 1/4t of salt and 1/4t of pepper until coarsely ground. Place the mixture in a large bowl and combine with melted butter. Sprinkle mixture onto the bottom of the baking dish. Set aside. 2. Bring water with 1/2t salt to a boil. Add macaroni and cook for about 12 minutes until al dente. Drain pasta. 3. Meanwhile, heat the olive oil and onion in skillet for 5-6 minutes until onion is translucent. Then add onion, cream, gouda, cheddar, Worcestershire, tabasco and cooked macaroni to pan. Season with 1/2t salt & 1/2t pepper. Cook until cheese is melted then add crumbled bacon. 4. 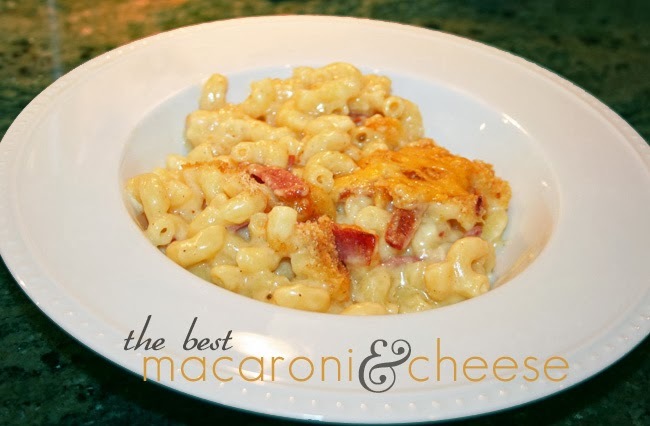 Pour macaroni mixture into baking dish on top of the bread crumbs. Sprinkle Parmesan cheese on top and bake for about 15 minutes or until golden brown. Let cool for 5 minutes before serving.